Qmmp, Qt-based multimedia player, released version 1.3.0 with many new features, improvements, and bug-fixes. Improvements to skinned plugin, qsui plugin, http plugin, stream browser. Removed mpris1 support, and various other changes. 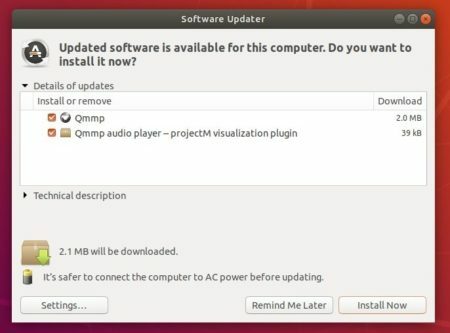 Qmmp 1.3.0 is available to install via its official PPA, for Ubuntu 16.04, Ubuntu 18.04, Ubuntu 18.10, Linux Mint 18.x and 19.x. Input your password (no asterisks feedback while typing) and hit Enter to continue. For qt4 version, use qmmp-qt4 and qmmp-plugin-pack-qt4 instead in the last command. You can manage the PPA repository via Software & Updates utility, under Other Software tab. 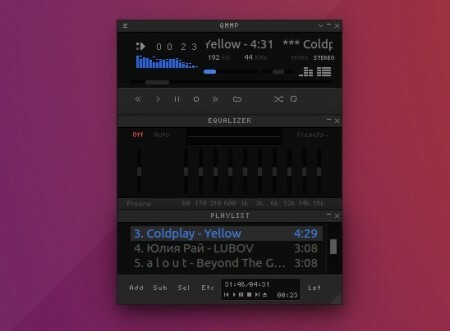 Qmmp 1.2.4, qt-based audio player with winamp or xmms look like user interface, and Qmmp 0.11.3 for Qt4 were released earlier today. The PPA repository has made the new releases packages for Ubuntu 16.04, Ubuntu 18.10, and Ubuntu 18.04. Qmmp, a Qt audio player with winamp or xmms like interface, has reached the 1.2.2 release a few days ago. A little different to previous releases, there’s no update for Qt4 release (Qmmp 0.11 series) along with Qmmp 1.2.2. The software has an PPA repository that offers the Qmmp 1.2.2 packages for Ubuntu 16.04, Ubuntu 17.10, and Ubuntu 18.04. Input your password (no visual feedback while typing) and hit Enter to continue. Qmmp, Qt-based multimedia player, has reached the 1.1.9 (and 0.10.9) release with some performance improvements and bug fixes. Qmmp 1.1.9 and 0.10.9 are different version series with same changes. Qmmp 0.10.x is released for Qt4, and Qmmp 1.1.x is for Qt5. The Qmmp release PPA has built the packages for Ubuntu 12.04, Ubuntu 14.04, Ubuntu 16.04, Ubuntu 16.10, and Ubuntu 17.04. Type in password (no visual feedback) when it prompts and hit Enter. The commands will install Qt4 version of Qmmp 0.10.9 in Ubuntu 12.04 and Ubuntu 14.04, and install Qt5 version of Qmmp 1.1.9 in Ubuntu 16.04 and higher. For the PPA repository, go to System Settings -> Software & Updates -> Other Software tab.